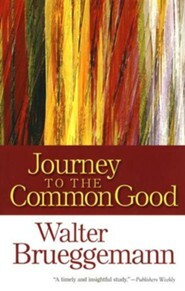 In Journey To The Common Good, respected author and theologian Walter Brueggemann turns his discerning eye to the most critical yet basic needs of a world adapting to a new era, an era defined in large part by America's efforts to rebuild from an age of terror even as it navigates its way through an economic collapse. 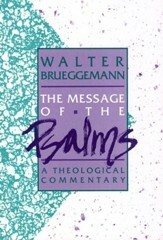 Yet in spite of these great challenges, Brueggemann calls us to journey together to the common good through neighborliness, covenanting, and reconstruction. Such a concept may seem overwhelming, but writing with his usual theological acumen and social awareness Brueggemann distills this challenge to its most basic issues: Where is the church going? What is its role in contemporary society? What lessons does it have to offer a world enmeshed in such turbulent times? The answer, of course, is the same answer God gave to the Israelites thousands of years ago: Love your neighbor and work for the common good. 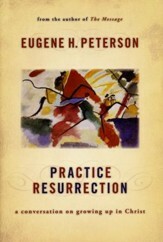 Brueggemann considers biblical texts as examples of the journey now required of the faithful if they wish to move from isolation and distrust to a practice of neighborliness, as an invitation to a radical choice for life or for death, and as a reliable script for overcoming contemporary problems of loss and restoration in a failed urban economy. 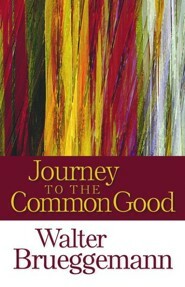 Respected author and theologian Walter Brueggemann turns his discerning eye to the most critical yet basic needs of a world adapting to a new era, an era defined in large part by America's efforts to rebuild from an age of terror even as it navigates its way through an economic collapse. Yet in spite of these great challenges, Brueggemann calls us to journey together to the common good through neighborliness, covenanting, and reconstruction. Such a concept may seem overwhelming, but writing with his usual theological acumen and social awareness Brueggemann distills this challenge to its most basic issues: where is the church going? What is its role in contemporary society? What lessons does it have to offer a world enmeshed in such turbulent times? The answer is the same answer God gave to the Israelites thousands of years ago: love your neighbor and work for the common good. 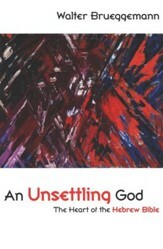 Brueggemann considers biblical texts as examples of the journey now required of the faithful if they wish to move from isolation and distrust to a practice of neighborliness, as an invitation to a radical choice for life or for death, and as a reliable script for overcoming contemporary problems of loss and restoration in a failed urban economy. 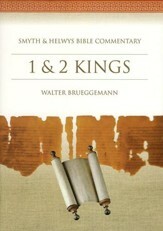 Walter Brueggemann is William Marcellus McPheeters Professor Emeritus of Old Testament at Columbia Theological Seminary in Decatur, Georgia. He is the world's leading interpreter of the Old Testament, and is the author of numerous books, including Introduction to the Old Testament: The Canon and Christian Imagination and Reverberations of Faith: A Theological Handbook of Old Testament Themes. I'm the author/artist and I want to review Journey to the Common Good.